+ WHAT IS RISE BAKING? + WHAT IS A RISE BAKING BOX ? + FOR WHAT AGES IS RISE BAKING APPROPRIATE? Our kits are fun for all ages and tested by a team of experts to ensure that they are easy and delicious. We always recommend adult supervision while in the kitchen. + WHERE ARE YOUR INGREDIENTS SOURCED? We strive to source quality ingredients to deliver a premium product. Our ingredients are all with unbleached flour and non-GMO ingredients. We strive for non-GMO, and organic ingredients when we can get it. + HOW DO I CONTACT RISE BAKING? If your questions are not answered here, please feel free to reach out to our Customer Care team. For a quick reply, please submit a contact form by clicking ‘Contact Us’ on our website. We aim to respond to all submissions within two business days. + HOW DO I GIVE PRODUCT FEEDBACK? We always love to hear about your experience or your suggestions. Email is the best way to reach us! You can email us at hello@risebaking.com or by clicking ‘Contact Us’ on our website. If you want to share your accomplishments and creations feel free to use #risebaking on any social media platform! + WHAT IF I AM ALLERGIC TO CERTAIN INGREDIENTS? All ingredients and allergens are listed on the recipe cards. We do use nuts in some of of our recipes; however, You can order them to be shipped nut free. Our ingredients are packaged in a facility that may contain tree nuts (pecans and coconut), wheat, eggs, dairy, and soy. If you have any questions or concerns, please contact us by clicking ‘Contact Us’ on our website or by emailing hello@risebaking.com. + HOW CAN I SHARE COMPLETED KIT RECIPES? We want you to inspire us. Share your finished Rise Baking recipes with the Rise Baking community by tagging us @risebaking or using #risebaking on Facebook, Instagram, Twitter and Pinterest. + HOW DO I REPORT A PROBLEM WITH MY ORDER? Oh no. We strive to ensure top quality and care for every Rise Baking product. If you have any problems with your kit or mix, email us at hello@risebaking.com or by clicking ‘Contact us‘ on our website. We do not accept returns on any of our kits. If you have any issues or questions with your order, please feel free to reach out to our Customer Care team at hello@risebaking.com or by clicking ‘Contact Us’ on our website. We want to make you happy! + CAN I CHANGE MY SHIPPING OR BILLING INFORMATION? Yes, just email us at hello@risebaking.com and we'd be happy to change your shipping or billing information. + CAN I SKIP A MONTH ? Not yet. The kit series ships around the 20th of every month, which we find is the best way to enjoy our kits. If you have extenuating circumstances, let us know and we’ll see what we can do. + WHEN DOES MY RISE BAKING MEMBERSHIP AUTO-RENEW? We will auto-renew your Bakers Club membership on the 5th of each month. + HOW CAN I CANCEL MY RISE BAKING MEMBERSHIP? You may cancel your subscription, with no cancellation fees. Simply email us at hello@risebaking.com with the subject line CANCEL RISE. You must cancel your membership by 10:00pm PST on the 1st of each month to be sure the cancellation occurs before being charged for your next Rise Baking Kit. We are unable to provide refunds and/or stop shipments once the order process has initiated. If you cancel your subscription between processing and shipment, that month’s kit will be the last that you receive as part of your subscription membership. + CAN I GIVE A RISE BAKING BAKING BOX AS A GIFT? Of course! Our Rise Baking kits make wonderful gifts! You can also go to our shop and buy a single kit as a one-off gift. Just add the item you want to cart and at checkout be sure to check the “is this a gift” box and you can enter a gift message. Your Rise Baking Kit purchase will be sent out 2-3 days after order is placed. Please allow 3-5 business days to arrive. We do not offer gift wrapping. Our kits arrive in our signature box featured on our website with the recipient’s’ name on the shipping label. + WHERE DOES RISE BAKING SHIP? Rise Baking currently ships anywhere in the continental United States, from amazing Detroit, Michigan. If you live outside of the US, please email us at hello@risebaking.com or by clicking ‘Contact Us’ on our website, so we can add you to our international waitlist — you’ll be the first to know when we begin shipping to your country! + WHEN WILL I RECEIVE MY RISE BAKING BOX? If you are a Bakers Club member, your Rise Baking kit will be sent to you around the 20th of each month. If you bought a single kit, your order will ship 3 days after you place your order. Please note that all our products are manufactured and shipped Monday through Friday from 9am-5pm EST and shipped via FedEx or the best available shipping method. + WHAT DO YOU CHARGE FOR SHIPPING? Shipping is free and included in your membership! + CAN I TRACK MY RISE BAKING ORDER? Currently we do not provide shipment tracking. However, you will receive a message from the Rise Baking team letting you know that your shipment left our facility. If you have questions regarding shipment tracking, please email us at hello@risebaking.com or by clicking ‘Contact Us’ on our website. + WHAT HAPPENS IF I CHANGE MY ADDRESS? If you would like to change your address simply send us an email at hello@risebaking.com or by clicking ‘Contact Us’ on our website, and we will be happy to assist you. Not yet. You can place separate orders for each item that you would like to ship to a different address. + ARE THERE ORDER CUT-OFF DATES AND TIMES? 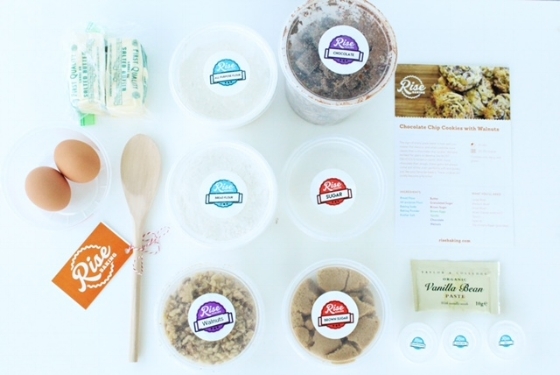 Ordering Rise Baking kits is easy. You can always order single kits any time. If you would like to become a member of the Rise Baking monthly Club and receive monthly, curated baking kits and special perks, you must sign-up by 10PM PST on the 15th day of the month. This means that if you join the Rise Baking Club before November 15th, you will receive the November kit. If you order the subscription after the November 15th, you will receive the December kit.